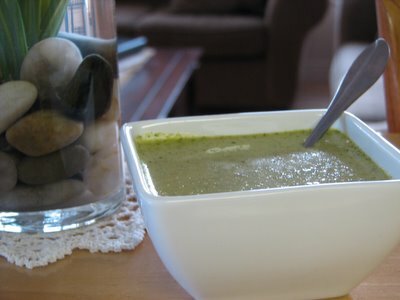 Thank You, Chloe, for the wonderful Broccoli Soup recipe. I had been surfing around for a good one and then wondered if she would have one, and voila! In a large saucepan, melt butter over medium heat. Add onion, and cook until softened, 5 minutes. Add nutmeg; cook until fragrant, 30 seconds.Stir in stock, broccoli potato and carrot. Bring to a boil; reduce heat. Simmer until vegetables are tender, for about 10 minutes.Purée soup in batches, filling blender halfway. Return to pot. Add cream and parmesan. Taste and add salt if needed. Sprinkle some pepper. I wasn't able to puree it as well as I'd liked because the babe has decided that the blender is scary. And I used milk because Mr. C had bought dessert whipping cream rather than regular cream :) But it turned out delicious! Chloe is a magician. Her magic recipe was so good even I could make it taste good. It's minus 17 degrees Celsius tonight, so the warm soup was lovely. Is there a recipe you've been searching for? This entry was posted on Wednesday, March 01, 2006 at 6:32 PM. You can skip to the end and leave a response. a good recipe for spinach. That will be great for Lent. anyone you want - it's so helpful! Shrek soup, yes that's what it is. But you made it look lovely. I've been looking, and REALLY looking for a hot chocolate without milk, recipe. No soya milk either. Ideas anyone? There is a page in german talking about doing hot chocolate with real cacao beans. They grind them and cook them with water and some chili. You might see it at the pictures without knowing German. Michelle has offered a good spinach pie recipe! I do not observe Lent, but if it would be great for it; go for it! I wish you were closer and you could come for lunch and have some! There are two bowls in the fridge just waiting to get heated up. I cut and apsted it from the e-mail from Chloe; can you do the same from the post? Shrek soup! Yes, that's great! And although the babe did not eat it, my son does actually like green food! Chloe;I was about to start searching for you and then saw that Gurgo has a link to one; will this one do? Do you need a translation? Thanks for providing this: we may need to translate it, however. no translation needed, the pictures are enough. i was really looking for such a recipe! you are a treasure Gurgo. See...you need to write your cookbook about this kind of exchange of recipes! I am cupping my hands up to my mouth and hollering: ANYONE GOT A GOOD GUMBO RECIPE??? SOMEONE? ANYONE?...I have never made Gumbo. Ever. So I am not the best person to provide you with one. Man that sounds and looks good! How did the kids like it? P.S. Now I am starving. LOL! I'm not really into cooking but I would like to try and make something easy that involves chocolate and is totally fattening lol! Aaaaww, thanks Cathy ... maybe you can siphon it through the phone or broadband cable !!!! Those bowls are supposed to be small salad bowls, but they are great for soup! This would be great; I don't have one off hand because there are wonderful brownies at our local grocer and I can not even try to compete with them; I actually usually make brownies from a box (shhh). Mr.C could not eat broccoli for medical reasons a couple of years ago as well...yes, you are the envy of children everywhere; they are wondering how they can get away with such excuses! I wish there were such a siphon! Yum! Looks like I'll be making soup. Great photo! I love trading recipes. I have so many that I've just started sharing with friends and we have so much fun. I'll have to email you some of our best family recipes when I get back from the Corpus Christi. I might have to try this one too. I usually get sick after driving down south because of allergies and the climate change. That is awesome! I didn't know; toot your horn you should! I wil definitely check out the web site and I buy that magazine! Good Afternoon!!! 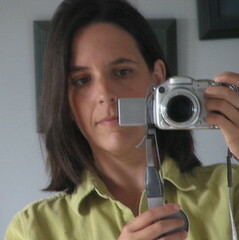 ctcthoughts.blogspot.com is one of the most outstanding innovative websites of its kind. I enjoy reading it every day. All the best.